This gorgeous delicate sterling silver bracelet measures 19cm in length and is engraved with up to 3 initials on one of the two heart pendants. This product allows a maximum of 3 initials and 3 full stops. Please include the full stops in the field below e.g. J.K.R. Necklace also comes presented in a gift box! Please note - we are unable to support special characters or accented letters, please refrain from entering these within your personalisation. 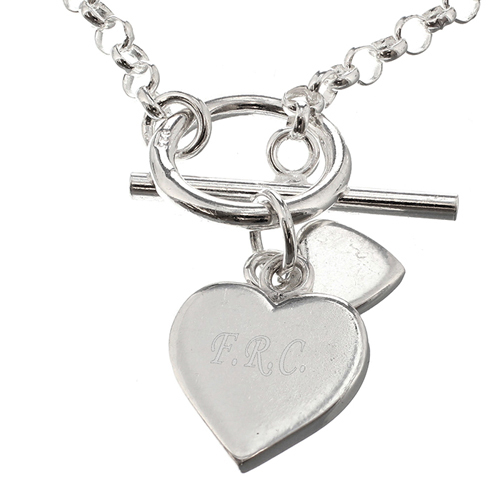 Personalise with up to 3 initials on one of the two heart pendants. This product allows a maximum of 3 initials and 3 full stops.